I don’t have to tell you it's that time of year again. While jumping from game to game every week may be making my backlog bleed, it at least feels very refreshing. Even better is that a lot of great deals on older games pop up at this time of year. A lot of my time these passed few weeks (awaiting November’s haul) was spent on Monster Hunter Freedom Unite – which I picked up for a cool twelve dollars. I must say I can imagine why Japan would go so nuts over this game. I stress “imagine” because I can’t for the life of me play the real meat of the game that is multiplayer. I’ve spent hours on several days trying to connect to a match via Ad-Hoc Party, but with no luck. It makes me wonder why Capcom decided to make Monster Hunter Tri for the Wii, rather than a console with feasible online play. 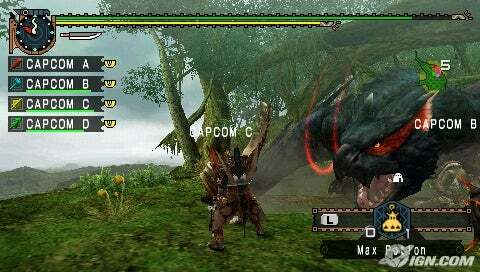 Until I see it on the HD consoles, I doubt I’ll ever experience the true Monster Hunter. -------------------------------------------------------------------------------------------------------------------------- • ICO on the PS3 looks amazing (haven’t gotten to SoTC yet). I can hardly believe this game is ten years old since - thanks to its amazing art-style - it looks better than many games that came out this year. • Played some GoW2 Horde with a friend... now I need to get Gears 3. • I have only played an hour of Uncharted 3 so far. Great opening. Not as good as UC2’s but who really thought that opening would be outdone? • Finished Twilight Princess a week ago. It’s an amazing game, but I can already tell it is not a very memorable one. It needed an identity separate from Ocarina like the other 3D Zeldas.